I’ve been pondering furniture for my flat recently, and that has made me think about one of Hermès’ most famous perfumes, Bel Ami. Why? Well, it’s all about the difference between what, in the antiques trade, I guess you’d call original and repro. Bel Ami is a bit like a lovely Chippendale chest of drawers that once attracted admirers from all over the world – not just for the beauty of its design but for the skill and complexity of its construction. The maestro in Bel Ami’s case was Jean-Louis Sieuzac, one of the finest perfumers of his time, who was also behind Fahrenheit for Christian Dior and Opium for Yves Saint Laurent. 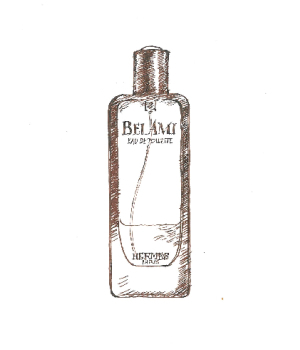 First launched in 1986, Sieuzac’s Bel Ami packed a powerful punch thanks to a combination of leather and pepper, and it was by all accounts a rich and complex scent. But apparently it didn’t sell, and when Hermès appointed Jean-Claude Ellena as its in-house perfumer in 2004, one of his first jobs was to reformulate Bel Ami. This new version is still very attractive, with a schoolroom scent of pencil shavings that, after an hour or two, settles down into a pleasing, if not especially unusual fragrance of the kind that’s often described as ‘classically masculine’ – a bit wood-smoky without being bitter, slightly sweet without being at all cloying. It reminds me a lot of one of my other favourite ‘classically masculine’ perfumes, Halston Z-14. What I wouldn’t describe it as would be particularly complex: it doesn’t change radically over the hours, though it does have good staying-power, and my amateur nose doesn’t detect lots of intriguing added ingredients, though I’m wondering if there’s a touch of clove-scented carnations. It is, in other words, a bit like a very good-quality piece of ‘repro’ antique furniture: looks pretty convincing on the outside, but when you open the drawers you realise they’re made of MDF instead of mahogany. A classy job nonetheless.